Your sweet Boxer will want to alert you when something new is heading your way. Your loyal, exuberant Boxer drooled his way into your heart. But he's beginning to bark when you leave for work or when other dogs walk by the house. Train your pooch to bark confidently at appropriate times, such as when he's watching out for you or exhibiting his silly side. A Boxer puppy needs enough room to roll around and ample play time or else his untapped energy can trigger barking. Engage him with positive activities, such as pouncing on toys, food puzzles and playing games with you, so that he's physically, emotionally and intellectually stimulated. According to Jenn Merritt, a North Carolina-based CPDT-KA dog trainer, a Boxer puppy will wiggle his tiny, docked tail and give a "woo woo" bark when soliciting play. You also can help squash future unwanted barking by making sure your puppy is introduced to a variety of textures, sights and sounds beyond people. 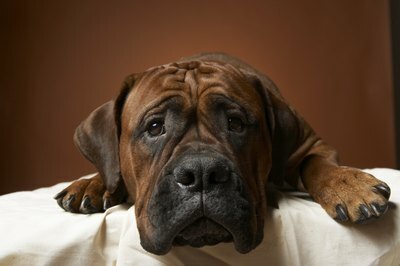 A Boxer will bark because he's distrustful of your friends at the door. However, he'll quickly retract his guard once he's confident there's no threat to you or him. In addition, Boxers hear noises up to 60 Hertz compared to a human's ability of 20 Hertz. That refers to frequency, not volume, so your Boxer friend is hearing a lot of things you aren't. In picking up unfamiliar sounds, your Boxer might try to alert you to something, such as the trash truck's arrival in 10 minutes. Merritt also says that Boxers bark to identify themselves to other dogs in the neighborhood. Because of his clown-like, outgoing nature, a Boxer needs extensive socialization outside the home. If your Boxer doesn't have enough exercise at 6 months old, he can easily go into a high-pitched bark that gets stronger as the anxiety increases. He might feel tense and uneasy about separation, thinking you won't return home from work. He also might bark loudly and run in circles when the doorbell rings for fear of something bad happening. A Boxer also can feel anxious when his territory is invaded, such as when you wash his favorite blanket or re-arrange his feeding area. If your four-legged pal is sick or injured and doesn't know what to do, he might bark then, too. How Old Is a Puppy Before It Recognizes Its Name?